In the 19th century, mines were referred to as torpedoes, a name probably conferred by Dennis Fletcher after the torpedo fish, which gives powerful electric shocks. 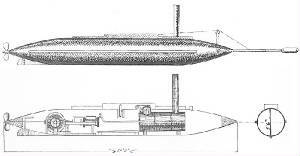 The Confederate torpedo boat CSS David with the spar torpedo mounted to the bow. A spar torpedo was a mine attached to a long pole and detonated when the ship carrying it rammed another one. 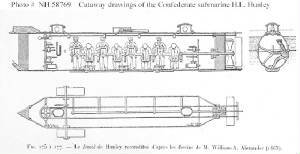 During the American Civil War, the Confederate submarine H. L. Hunley used a spar torpedo to sink the USS Housatonic on February 17, 1864. 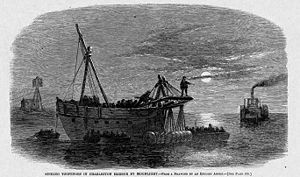 The USS Housatonic (1861), launched November 20, 1861, was sunk by the Confederate submarine H. L. Hunley on February 17, 1864. 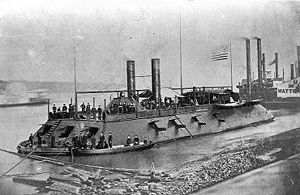 USS Housatonic, a 1240-ton (1.1 million-kilogram) steam-powered sloop-of-war with 12 large cannons, was stationed at the entrance to Charleston, South Carolina harbor, about 5 miles (8 kilometers) out to sea. 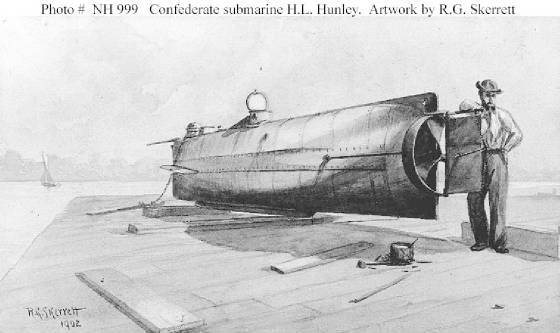 In an effort to break the naval blockade of the city, Confederate Lieutenant George E. Dixon and a crew of seven volunteers, aboard the H. L. Hunley, attacked Housatonic, successfully embedding the barbed spar torpedo into her hull. The torpedo was detonated as the submarine backed away, sending Housatonic and five of her crew to the bottom in five minutes, although many survived by boarding two lifeboats or by climbing the rigging until rescued. H. L. Hunley on a pier before her sinking. Hunley had made her first and only attack against a live target on that fateful night of February 17, 1864, she played a small part in the American Civil War, but contributed a major role in the history of naval warfare. 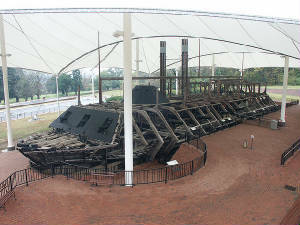 The first Civil War era ship sunk by a mine was the USS Cairo in 1862 in the Yazoo River. Rear Admiral David Farragut's famous statement in 1864, "Damn the torpedoes, full speed ahead!" refers to a minefield laid at Mobile, Alabama. 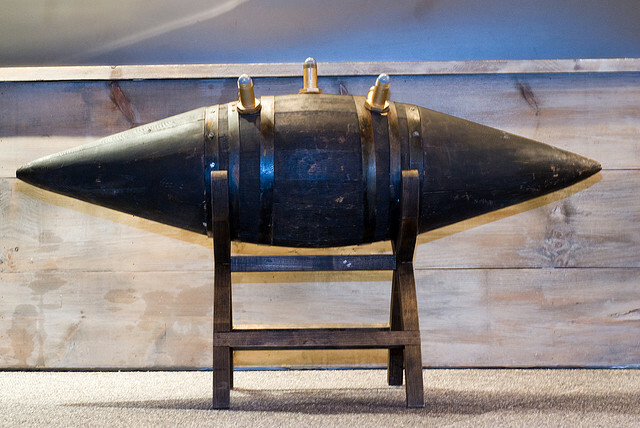 A Harvey Torpedo was a type of floating mine towed alongside a ship, and was briefly in service in the Royal Navy in the 1870s. Other "torpedoes" attached to ships or propelled themselves. One such weapon, called the Whitehead torpedo after its inventor, caused the word "torpedo" to be used for self-propelled underwater missiles rather than static devices. During the U.S. Civil War, the term "torpedo" was also used to refer to various types of bombs, boobytraps, and "sub-terra shells" or "land torpedoes" (artillery shells with pressure fuses buried in the road by retreating Confederate forces to delay their pursuers). These were the forerunners of modern land mines and hand grenades. 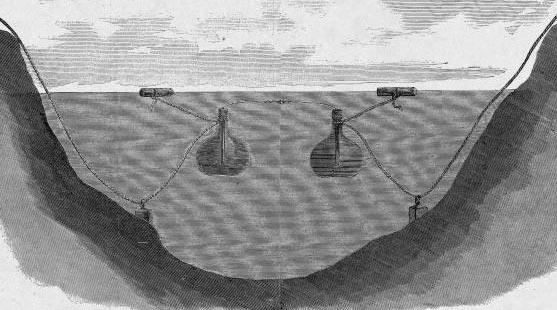 Harpers Weekly, January 1863, illustration of naval torpedoes moored to the river bottom (the predecessors of modern naval mines). 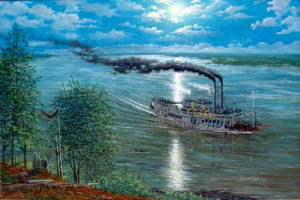 David Farragut encountered tethered and floating contact mines in 1864 at the American Civil War Battle of Mobile Bay. After his leading ironclad, USS Tecumseh, was sunk by a tethered contact mine (torpedo), his vessels halted, afraid of hitting additional torpedoes. Inspiring his men to push forward, Farragut famously ordered, "Damn the torpedoes, full speed ahead!" Frequently used in combination with coastal artillery and hydrophones, controlled mines (or command detonation mines) can be in place in peacetime, which is a huge advantage in blocking important shipping routes. The mines can usually be turned into "normal" mines with a switch (which prevents the enemy from simply capturing the controlling station and deactivating the mines), detonated on a signal or be allowed to detonate on their own. The earliest ones were developed around 1812 by Robert Fulton. 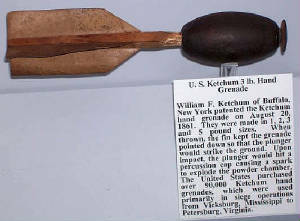 The first remotely controlled mines were moored mines used in the American Civil War, detonated electrically from shore. They were considered superior to contact mines because they did not put friendly shipping at risk. Modern examples usually weigh 200 kg (440 lb), including 80 kg (175 lb) of explosives (TNT or hexatonal). The USS Cairo was only in service for 11 months before making history as the first U.S. marine vessel to be sunk by an electronically detonated mine. (Right) Photograph of the USS Cairo in 1862 in the Mississippi River, with crewmen on deck, a boat at her port side, and river steamers in the background. Courtesy U.S. Naval Historical Center. 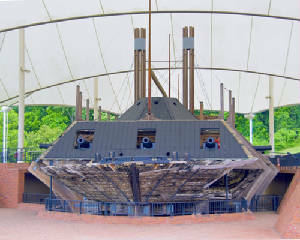 The USS Cairo was one of seven ironclad gunboats named in honor of towns along the upper Mississippi and Ohio rivers. These powerful ironclads were formidable vessels, each mounting thirteen big guns (cannon). On them rested in large part, Northern hopes to regain control of the lower Mississippi River and split the Confederacy in two. 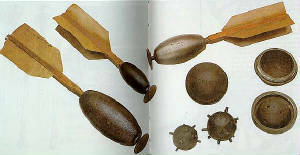 During the U.S. Civil War, the term "torpedo" was also used to refer to various types of bombs and boobytraps. Confederate General Gabriel J. Rains deployed "sub-terra shells" or "land torpedoes", artillery shells with pressure fuses buried in the road by retreating Confederate forces to delay their pursuers. These were the forerunners of modern land mines. Union generals publicly deplored this conduct. Regarding Booby Traps and land mines found during Sherman's March to the Sea, General William T. Sherman recorded in his Memoirs: "On the 8th, [of December 1864] as I rode along, I found the column turned out of the main road, marching through the fields. Close by, in the corner of a fence, was a group of men standing around a handsome young officer, whose foot had been blown to pieces by a torpedo planted in the road. He was waiting for a surgeon to amputate his leg, and told me that he was riding along with the rest of his brigade-staff of the Seventeenth Corps, when a torpedo trodden on by his horse had exploded, killing the horse and literally blowing off all the flesh from one of his legs. I saw the terrible wound, and made full inquiry into the facts. There had been no resistance at that point, nothing to give warning of danger, and the rebels had planted eight-inch shells in the road, with friction-matches to explode them by being trodden on. This was not war, but murder, and it made me very angry. I immediately ordered a lot of rebel prisoners to be brought from the provost-guard, armed with picks and spades, and made them march in close order along the road, so as to explode their own torpedoes, or to discover and dig them up. They begged hard, but I reiterated the order, and could hardly help laughing at their stepping so gingerly along the road, where it was supposed sunken torpedoes might explode at each step, but they found no other torpedoes till near Fort McAllister." 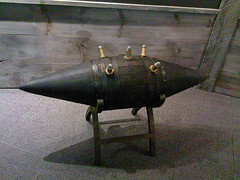 (Left) A coal torpedo. 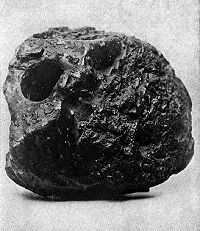 This example was prepared with a partial coal dust coating and the plug left out. Confederate secret agent John Maxwell used a clockwork mechanism to detonate a large "horological torpedo" (time bomb) on August 9, 1864. The bomb was hidden in a box marked "candles" and placed aboard a barge containing Union ammunition (20,000–30,000 artillery shells and 75,000 small arms rounds) moored at City Point, Virginia, on the James River. The explosion caused more than $2 million in damage and killed at least 43 people. The coal torpedo allegedly sank the SS Sultana, making it the greatest maritime disaster in United States history. 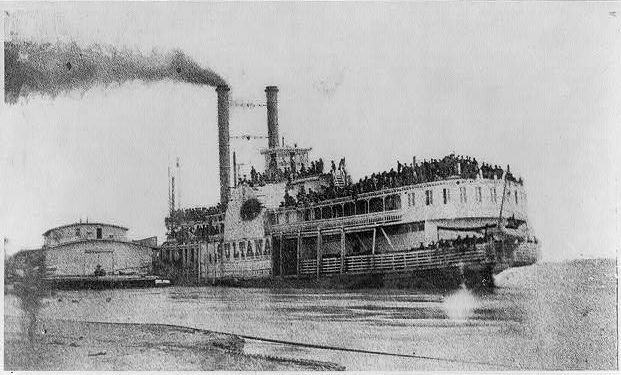 (Above) Photograph of the ill-fated "Sultana", Helena, Arkansas, ca. April 26, 1865. 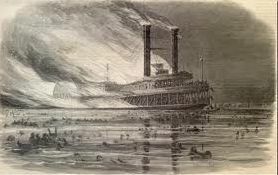 Sketch of the "Sinking of the Sultana"
In 1888, furthermore, a St. Louis resident named William Streetor claimed that his former business partner, Robert Louden, made a deathbed confession of having sabotaged the Sultana by a coal torpedo. Louden was a former Confederate agent and saboteur who operated in and around St. Louis. Louden had the opportunity and motive to attack the Sultana. He may have had access to the means. (Thomas Edgeworth Courtenay, the inventor of the coal torpedo, was a former resident of St. Louis and was involved in similar acts of sabotage against Union shipping interests.) Supporting Louden's claim are eyewitness reports that a piece of artillery shell was observed in the wreckage. Louden's claim, however, remains controversial. "This is an almost indispensable book for all Civil War aficionados, covering everything from pistols to ironclads and steamships. The author's own illustrations add to the charm and value of this publication and make its information accessible even to the novice. Many Civil War buffs have known this book for years and will be delighted to find that it is once again readily available. A true classic, this book belongs in every Civil War library!" "When I first picked this book up in the local library, I expected just another poorly done coffee table book. Boy, was I wrong. As a amateur writer, I soon came to appreciate it's unusual wealth of detailed info on the the equipment and tactics used in the Civil War. The amazing thing is that there are no photos or even color pictures! The author's drawings are clear, numerous, and very helpful. This is a must-have book for any Civil War researcher, re-enactor, or enthusiast!" General Gabriel J. Rains, director of the Confederate Torpedo Bureau, penned his Torpedo Book as a manual for the fabrication and use of land mines and offensive and defensive water mines. 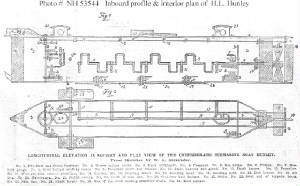 Includes 21 scale drawings, Notes Explaining Rebel Torpedoes and Ordnance by Captain Peter S. Michie, and documents from the Federal perspective the construction and use of these "infernal machines." A detailed accounting of the vessels sunk or damaged by Confederate torpedoes and numerous photographs of existing specimens from museums and private collections complete this significant compilation. Recommended to fellow Salty Dogs to Civil War Buffs to persons interested in naval warfare. The ship's crew hoped to destroy the Yankees' western Arctic whaling fleet, but four months after the war ended, the Shenandoah's captain learned that he had been fighting a war "without cause or state." He had gone from being an enemy combatant to a pirate, an offense that could get him hanged. He camouflaged the vessel, circumnavigated the globe, and attempted to surrender in England. By late 1864, moreover, it seemed clear that the Confederacy had only a short time to live. 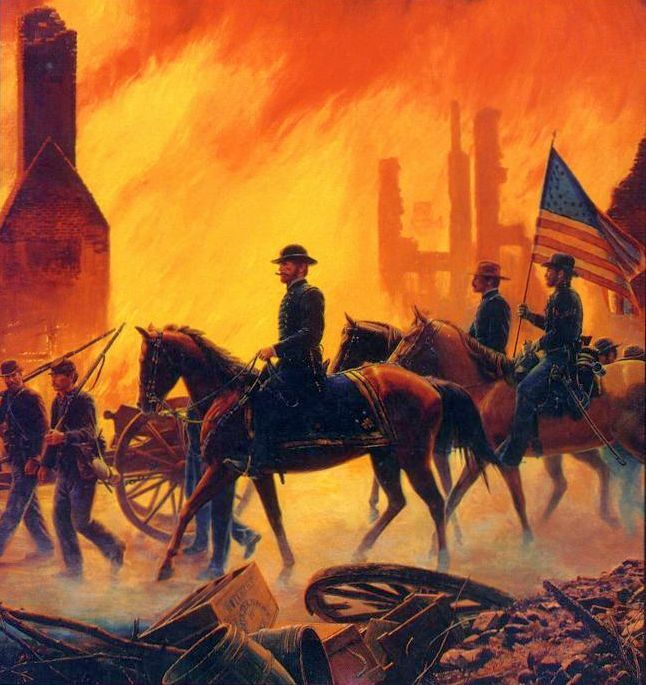 In the west, the Army of the Tennessee was a spent, shattered force. In the east, Lee's Army of Northern Virginia was besieged at Petersburg, and the depredations of Sherman and Sheridan brought Southern soldiers to the brink of starvation. In the midst of this gloom, a Confederate ship, the Shenandoah, left Britain and launched a series of remarkably successful raids on Union shipping across vast expanses of open sea. However, cut off from communication with the Southern homeland, the crew was unaware of the surrender of Confederate armies in April 1865. Since the Shenandoah continued raiding, in strictly legal terms the sailors on board were now pirates. When the officers realized this, they began a heroic effort to find a refuge for themselves and their crew. Baldwin and Powers have written a stirring account of one of the more obscure episodes of the Civil War, filled with stunning examples of personal courage in the face of adversity. Sources: Blair, Clay. Silent Victory. Philadelphia: Lippincott, 1975; Boyne, Walter J. Clash of Titans. Simon and Schuster; 1995. ISBN 0-684-80196-5; Crowley, R.O. "Confederate Torpedo Service". The Century, Volume 56, Issue 2, The Century Company, New York, June 1898; Hartmann, Gregory K. with Scott C. Truver (1991). Weapons That Wait: Mine Warfare in the U.S. Navy. Annapolis: Naval Institute Press. ISBN 0-87021-753-4; Milford, Frederick J. "U.S. Navy Torpedoes: Part One—Torpedoes through the Thirties". The Submarine Review, April 1996. (quarterly publication of the Naval Submarine League, P.O. Box 1146, Annandale, VA 22003); Milford, Frederick J. "U.S. Navy Torpedoes: Part Two—The Great Torpedo Scandal, 1941-43". The Submarine Review, October 1996; Milford, Frederick J. "U.S. Navy Torpedoes: Part Three—WW II development of conventional torpedoes 1940–1946". The Submarine Review, January 1997; O'Kane, Richard H. (1987). "Seventh Patrol", Wahoo: The Patrols of America's Most Famous World War II Submarine. Novato, California: Presidio Press; Perry, Milton F. Infernal Machines: The Story of Confederate Submarine and Mine Warfare. Baton Rouge: Louisiana State University Press, 1985. ISBN 0-8071-1285-2; Memoirs of General William T. Sherman.